This coating removal procedure uses a controlled, low temperature, localized heating method for removing thick coatings by an overcuring or softening means. Select an appropriate thermal parting tip. 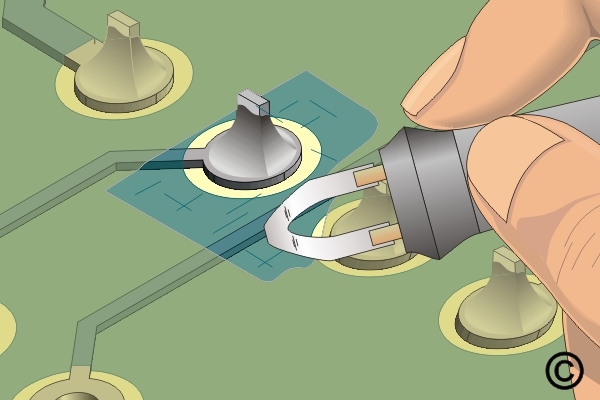 Set the tip temperature and apply the thermal parting tip to the coating, using a light pressure. The coating material will either soften or granulate. The tip temperature should be regulated to a point where it will effectively "break down" the coating without scorching or charring. A second option uses hot air. Set up the hot air tool and adjust flow rate and temperature to suit specific coating removal application. Soldering irons should not be used for coating removal as their high operating temperatures will cause the coatings to char and possibly delaminate the printed board base material. 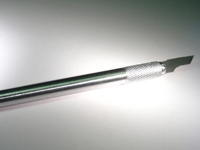 The use of thinned down soldering iron tips or soldering iron heated thin cutting blades are not recommended since they do not provide controlled heating and may present dangerous sharp edges to the workpiece surface. Figure 1: Lightly apply thermal tip to coating to soften or granulate the material. 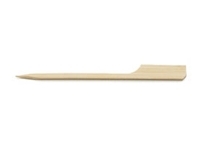 Figure 2: Apply hot air to the work area and use a wood stick to remove the overcured coating. 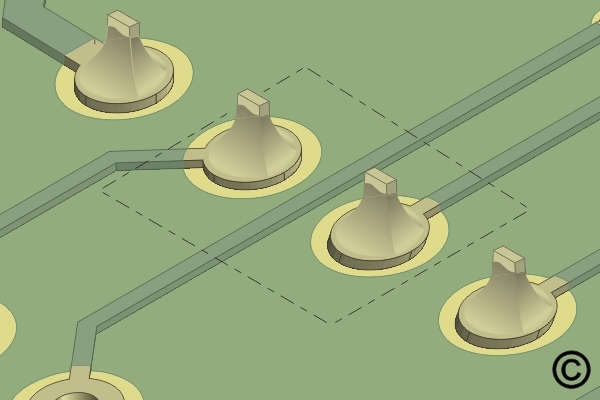 Select an appropriate thermal parting tip to suit the workpiece configuration. Set the nominal tip temperature, using the manufacturer's recommended procedure. Gradually reduce the coating thickness around the component body without contacting the board surface. Clip leads of component parts that are known to be faulty, thus permitting removal of the part body separately from leads and solder joints. 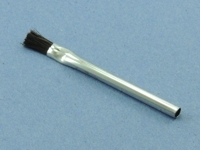 Low pressure air or a brush should be used to remove the loosened coating. Once sufficient coating has been removed, leaving only a small bonded joint between the part body and printed board, heat the component body with the thermal parting tool or hot air jet to weaken the bond beneath the component. Lift the component body free of the printed board using small pliers. Twist the component prior to removal to shear any remaining epoxy bond to the printed board surface. Once the component body has been removed from the board surface, the remaining coating material can be removed by additional thermal parting. The remaining leads and solder joints are then removed by appropriate solder extraction means. 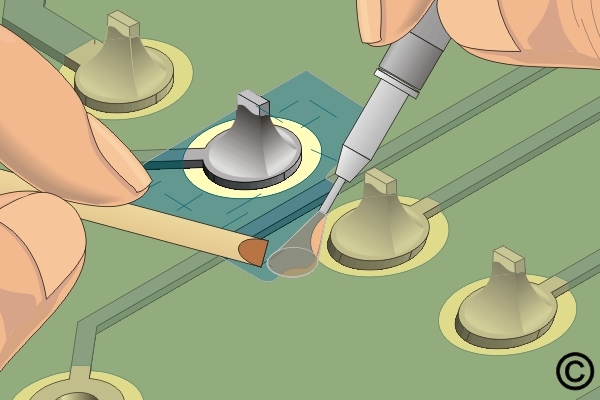 By control of the gas/air temperature, flow rates and jet shape, the hot air method can be applied to almost any workpiece configuration on both the component and solder side of the printed board without damage. Extremely delicate work can be handled in this manner while permitting direct observation of the heating action. Set up the hot air tool per the manufacturer's instructions. Adjust flow rate and temperature to suit specific coating removal application. Never set the gas/air temperature at a level that will cause scorching or charring of the coating material or reflow the solder connections. When the coating has been removed, use appropriate solder extraction method to remove components if needed.